• 10 Amazing Human Interest Stories: Fascinating people make up College World Series landscape. 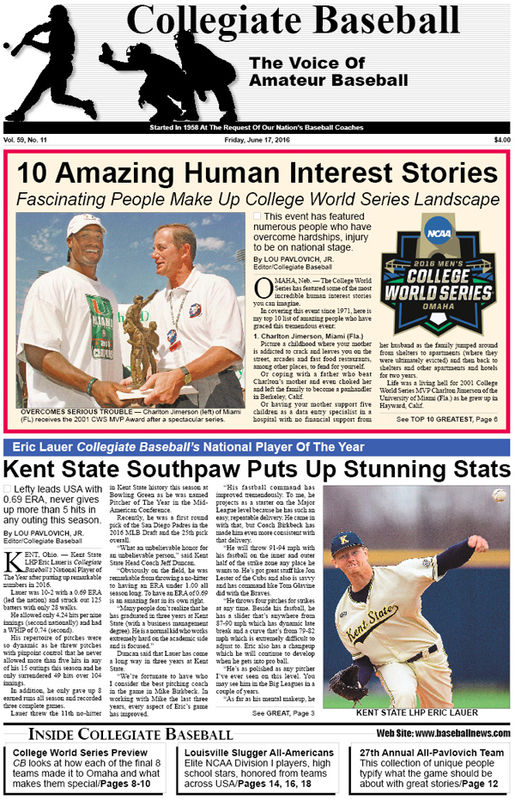 • Collegiate Baseball’s National Player of The Year: LHP Eric Lauer of Kent State puts up incredible numbers in 2016. • Lou Pavlovich Column: Stall tactics must be stopped at College World Series. • Editorial: Automatic bids should go to season conference champions. • Final Results For Regional, Super Regional Games: Every score, highlights in special chart. • College World Series Preview: Capsule looks at final 8 teams that made it to Omaha. • Collegiate Baseball Top 30 Presented By Big League Chew: Florida No. 1 entering College World Series with superb 52-14 overall record. • College Notes: Minnesota State RHP Dalton Roach throws 171 pitches in 11-inning game. • 2016 All-Pavlovich Team: Special people in baseball honored with 27th annual rundown. • Ruleball With Rich Marazzi: When players don’t pay attention, problems erupt. • Louisville Slugger Freshmen All-Americans: Incredible group headed by four special players. • Louisville Slugger High School All-Americans: Amazing athletes are led by National Player of The Year Kyle Muller of Dallas Jesuit H.S. (TX) who was 9-0 as a pitcher with 142 strikeouts and also hit .397 with 15 HR, 8 2B, 5 3B, 20 stolen bases. • Collegiate Baseball’s National High School Top 30 Poll: Buchanan H.S. (Clovis, Calif.) No. 1 after rolling to 30-1 record. • High School Notes: Seton Hall Prep (West Orange, N.J.) pulls off triple steal. • Coaching Changes Across USA: Augie Garrido of Texas steps down, among a host of other announcements. • NCAA Div. 2 Championship: Nova Southeastern captures school’s first national title. • NCAA Div. 3 World Series: Trinity (Tex) wins national title. • NAIA World Series: Lewis-Clark St. captures 18th national title. • NJCAA Division I: Yavapai (Ariz.) wins fourth national championship. • NJCAA Division 2: Jones County (Miss.) wins its first national title. • NJCAA Division 3: Tyler (Tex.) captures its third straight championship. • California J.C. Championship: Santa Rosa beats Golden West for its third state baseball title. To purchase the June 17, 2016 edition of Collegiate Baseball or subscribe, CLICK HERE.